When Apple introduced the iPad mini, they spent quite a bit of time comparing it to the Google Nexus 7, especially when it came to the merits of the iPad mini's 4:3, 7.9-inch screen over the 16:10, 7-inch screen of the Nexus 7. Physical screen size is only one factor, however. There's also screen resolution to consider, something Apple often touts with their Retina display products like the iPhone 5, iPod touch 5, iPad 4, and MacBook Pro. But not the iPad mini. So, when we put everything on the table, how well does the iPad mini stack up not only to the Nexus 7, but the similarly screened Amazon Kindle Fire HD? Apple's math highlighted the 35% larger physical screen size (29.6 square inches vs. 21.9 square inches). When Amazon announced their quarterly loss last week, however, they switched the topic to screen resolution, and measured the iPad mini's 1024x768, 163 ppi display against the Kindle Fire HD's (identical to Nexus 7) 1280x800, 254 ppi display. Amazon's math worked out to 30% more pixels (1,024,000 vs. 786,432 pixels) and 33% higher pixel density (216 vs. 163). That means things will look bigger on the iPad mini (bigger pixels), but you'll see more things on the Android tablets (more pixels). The iPad mini also has greater height (in landscape orientation) and width (in portrait orientation), thanks to its 4:3 aspect ratio. That's great for anything that requires reading, including ebooks, web pages, and even multi-column interfaces. Here's an example of a popular website on the iPad mini (left) and the and the Nexus 7/Kindle Fire HD 7 (right), in both landscape (top) and portrait (bottom). I've highlighted the interface chrome to better differentiate active content areas. 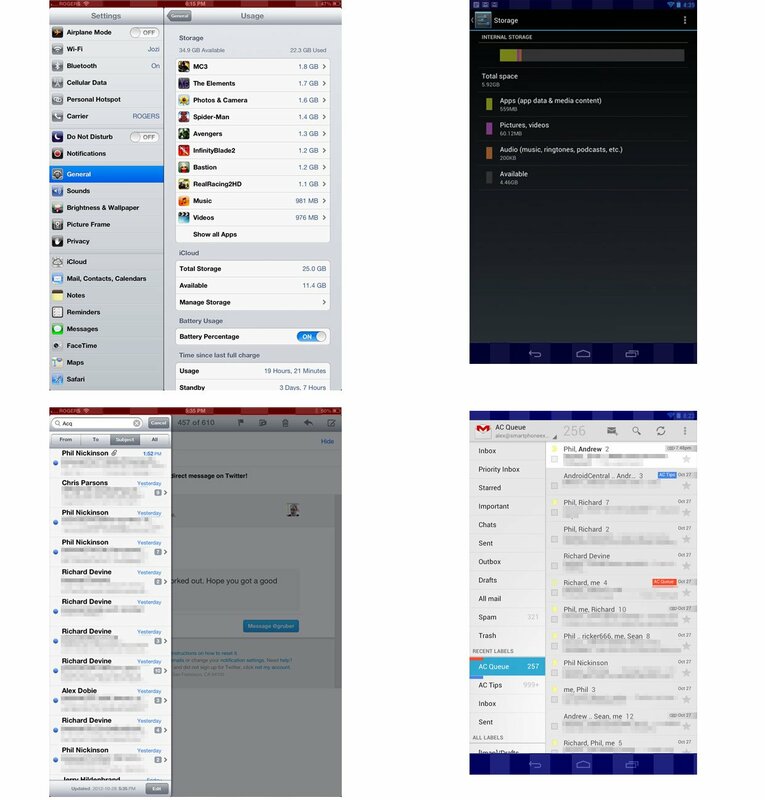 Here's an example of a list-view based app, in the case the native mail apps, on the iPad mini (left) and the and the Nexus 7/Kindle Fire HD 7 (right), in portrait orientation. I've highlighted the interface chrome to better differentiate active content areas. Where the iPad mini shares exactly the same, consistent tablet interface as the iPad, with multicolumn, tablet-class apps, the Nexus 7 combines aspects of Android smartphone and tablet interfaces on an app-by-app basis. That's likely a stop-gap on Google's part, however, and we'll hopefully see more tablet-optimized interface from Google in the near future. Likewise, Apple has over 250,000 iPad-optimized apps on the App Store, all of which will run pixel-perfectly on the iPad mini. Android is still severely lacking when it comes to tablet apps. Again, that should change as Google's tablet platform matures. (The Amazon Kindle Fire isn't really a tablet, it's a media appliance, so while it's interface is good enough for that, it's not really directly comparable to either the iPad mini or Nexus 7). However, that media content brings up another difference between the small tablets. The Nexus 7 and Kindle Fire 7 HD have an aspect ratio of 16:10, closer to the 16:9 of the iPhone 5, which offers greater width (in landscape orientation) and height (in portrait orientation). That's better for HD video and single column lists. Here's an example of a popular movie on the iPad mini (left) and the and the Nexus 7/Kindle Fire HD 7 (right), in both widescreen (top) and full screen (bottom). I've highlighted the interface chrome to better differentiate active content areas. The iPad mini shows the wide screen version of the movie at a larger size, but downscales it from 1280 horizontal pixels to 1024 horizontal pixels (and vertically downscales from 720p to 585p). 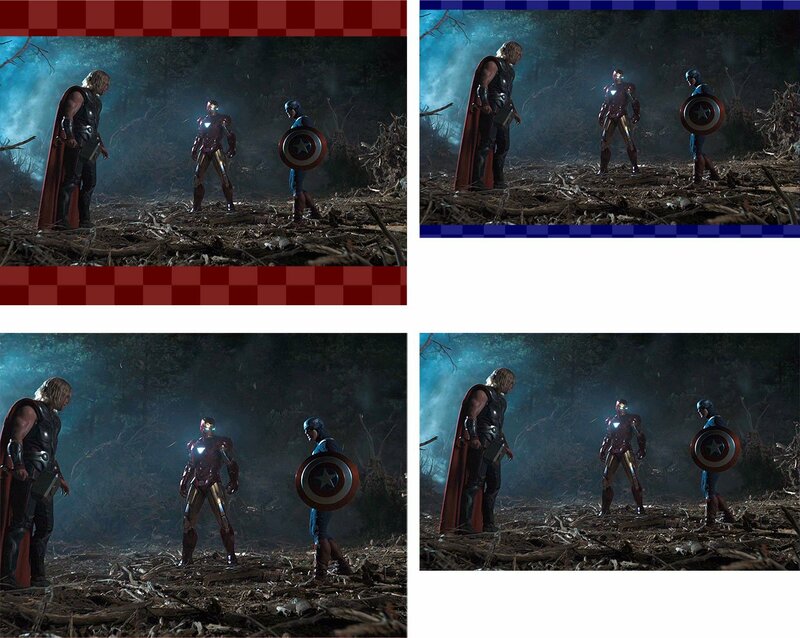 Full motion graphics, like movies and video games, however, are extremely resilient when it comes to screen density (just look at the variety of sizes 1080p television sets come in). So, it won't look terrible, but it won't look as good as the pixel-perfect Android tablets. At full screen, the iPad mini is much bigger, but also cuts off much more of the picture on both sides, an absolute deal-breaker for movie fans. So what does all this mean? Apple is right in that you do get both bigger content on the iPad mini and more usable display area for most types of apps and media. Amazon is right in that their display is better. For most people, for most things, bigger beats better. Add to that Apple's huge advantage in both tablet software and international content, and it makes for a compelling argument that in this case, the iPad mini overcomes the relatively lower pixel density to provide a more compelling product overall. I'm one of those people, however, for whom display density does matter greatly. I'm used to an iPhone 5 and iPad 3 (same as iPad 4) and MacBook Pro all with Retina display. Chunky pixels are like sandpaper on my pampered pupils. While the iPad mini is better than the iPad 2, it's identical to the iPhone 3GS, and going back to that is going to be tough. Design is compromise, however. You can't have everything and you certainly can't have it all now. The iPad mini is 7.2 mm thin, thinner by half than an iPad 3 or iPad 4. If Apple had crammed a Retina display in now, not only would battery life have suffered, but it would have become much thicker and much heavier. If they'd used a 720p display like the Nexus 7 or Amazon Kindle Fire 7 HD, they would have broken compatibility with those 250,000 existing iPad apps. Likewise If they'd switched to the iPhone and iPod touch interface -- they would have made a big iPod touch instead of a small iPad. And Apple made a small (concentrated) iPad. The iPad mini will likely go Retina with the second or third generation, and all of these concerns will disappear, like the pixels on the display. Until then, check out the example above and see if the difference in size and content area make the iPad mini a good compromise for you, at least for now.